These Caspian drawings are especially valuable as constituting the earliest record of the daily avocations of primitive man, but they are remarkable, too, for their animation and boldness of line. This is very notable in the drawing from Morella la Vella, the earliest battle picture in existance. The exaggerated legs of the two figures beside this may perhaps be an artistic convention. 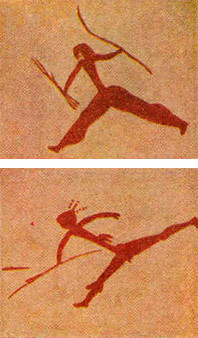 Hunting naturally forms the subject of many Caspian paintings, which incidentally furnish proof of the very early invention of the bow and arrow, as in this scene of a herd of deer driven over a cliff. The animated picture beside this shows a man collecting wild honey with bees buzzing around. Settled in south-eastern Spain at a period that may be roughly dated between 10000 and 14000 BC, the Caspians left in their cave dwellings which prove their possession of a high degree of culture. Thus, in this group at Cogul (left) depicting perhaps, a marriage scene, although the male figure (right) and the two female figures above him, all three perhaps ritual dancers.